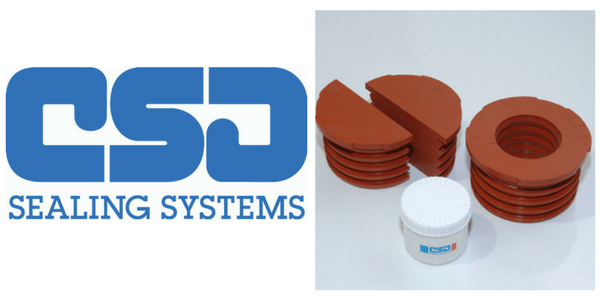 CSD SLIPSIL Waterstop Duct Seal Plugs are designed to seal metallic or plastic pipes and cables against gas and water ingress at pressures in excess of 2.5 bar and fire resistant for up to 2 hours – duct seal plugs are available in a range of sizes to suit services between 5mm and 520mm in diameter. 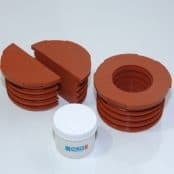 CSD SLIPSIL duct seal plugs ensure ducts or building entries are dry and that water pressure does not build up behind the seal which could cause failure during the curing of the sealant layer and consist of 2 equal parts which allow them to be inserted after all pipes or cables in a conduit are installed. SLIPSIL sealing plugs are designed for best use in empty or single service building entry or cable duct ends but can also be used to seal in running water conditions. In this instance the duct must be circular and have an internal diameter within the sealing tolerance of the sealing plug of -1mm/+0.7mm. For applications with multiple cables or where re-entry for adding, removing or replacing cables is required, CSD NOFIRNO duct seals are available – view the complete range of CSD Sealing Systems. Step 1 – Before starting the installation, any dirt or oil residues should be removed from the conduit opening. The internal diameter should be checked to make sure it is within tolerance of the CSD SLIPSIL sealing plug selected. Step 2 – The inside wall should then be treated with CSD lubricant along a distance which approximately corresponds with the length of the sealing plug. Step 3 – The inside surfaces of both segments of the sealing plug need to then be covered with CSD lubricant. Step 4 – The outer surfaces of both segments of the sealing plug need to be then covered with CSD lubricant. Step 5 – Place both segments of the sealing plug into the conduit opening as far as the first serration. This should be placed around the pipe or cable if one is ducted. Step 6 – Push both segments of the sealing plug evenly by hand, serration by serration, further into the conduit opening. Step 7 – For some plugs at extreme tolerance, a wooden section and mallet may be required. Step 8 – Air can become trapped inside the penetration. Use a lubricated screwdriver and carefully insert the end between the two plug segments to release the air. Step 9 – To satisfy certification requirements the flanged edge should be flush against duct. 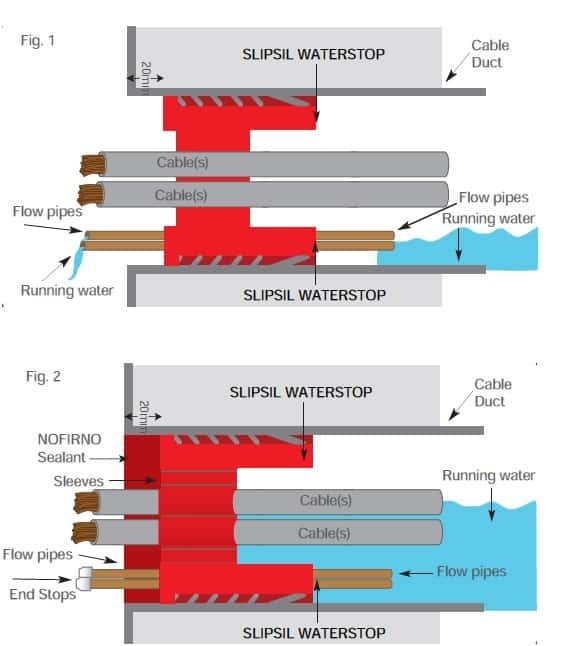 Step 10 – Inspect the completed seal to ensure that the SLIPSIL plug is correctly inserted and in cases with a ducted pipe or cable that it is correctly fitting. CSD SLIPSIL Sealing Plugs have gone through 3 pressure tests at nominal dimensions to determine the pressure ratings for plugs with smallest, medium and largest inlets as well as 3 pressure tests with the minimum pipe diameter and the widest conduit opening to determine tightness and extreme tolerances. This procedure has to be repeated with the smallest conduit opening and the largest pipe diameter to determine ease of installation. Finally, the largest pipe diameter has to be tested in the widest conduit opening to determine tightness in another extreme condition. This creates a total of twelve pressure tests for each series to determine the operational tolerances and ease of installation.